You need to make a decision. You do the research. You gather all the available data. You analyze it, discuss it with colleagues, focus groups, friends, and strangers. You gather all the feedback and viewpoints. And, finally, you feel prepared. You push the button knowing that you will succeed, for you have done all the right things. Simon Sinek would argue that you failed because you started your decision-making effort with what you need to do rather than with why you need to do it. In his book, Start with Why: How Great Leaders Inspire Everyone to Take Action, Sinek argues that organizations and leaders who start with what they are doing rather than with why they are doing it are going about their business backwards and are ultimately not going to achieve the level of success they desire. These organizations do not necessarily fail because their products or services are inferior or costs higher; in fact, in some instances, a company with a superior quality product offered at a lower price point than its competitors may still lose market share. How can that be possible? Sinek tells us that the answer is simple: Organizations that inspire their customers with why they do business will have loyal customers willing to be inconvenienced by higher cost, longer lead times, fewer features. Those that market based on what they offer will have loyal customers only so long as they continue to offer more and better features and services at lower cost. The other benefit to starting with why: Personal fulfillment and increased morale. Sinek argues that an employee who understands why the organization is doing its work, creating its product, or offering its services will feel s/he has a purpose in the work and thus contribute at high levels. Does this argument ring true for you? It does for us. Thrivner offers products and services to its clients, while also providing benefits and flexibility to its employees. What distinguishes us is that we create those products and services and offer benefits and flexibility to our employees to fulfill our reason for existing: to create a world in which everyone thrives. We realized through our discussion of Start with Why that Sinek’s approach is, for Thrivner, the natural order of things. And our clients and employees benefit. Sinek, Simon. 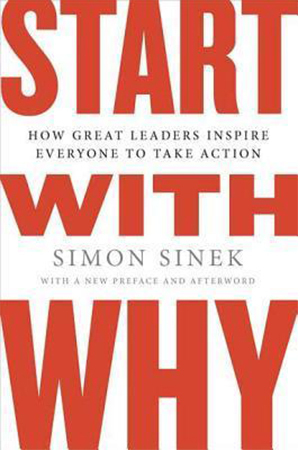 Start with Why: How Great Leaders Inspire Everyone to Take Action. Portfolio, 2011.